Dr. Carl Pankok graduated from the NC State OSE Program in December 2015. Prior to completion of his doctoral degree he presented and published research on the importance of worker knowledge in slips, trips and falls. 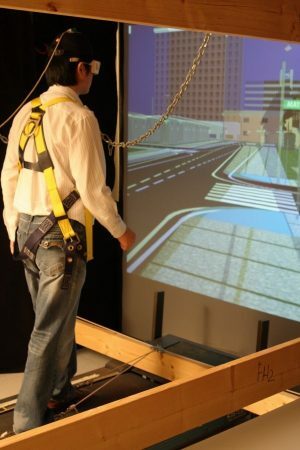 Pankok and several other graduate students working in the Ergonomics Lab at NC State conducted an elaborate virtual reality-based experiment demonstrating that locomotor a priori knowledge of work environment conditions as well as training on slip and trip hazards served to mediate gait control under hazardous conditions. Furthermore, Pankok et al. found that the degree of operator cognitive load while walking, specifically map or instruction-based navigation using a personal data assistant, also dictated locomotor capability to negotiate slip andtrip hazards with higher cognitive load leading to less proactive control. This research was presented at the 19th International Ergonomics Association Congress in Melbourne, AUS and an excerpt was published as a magazine article in Occupational Safety & Health in December, 2015. This research is important because the number of U.S. worker deaths due to slips, trips and falls has steadily increased from 1992 to 2012 with a staggering 28,000 cases in 2012. In addition, the U.S. BLS reported 16% of workplace deaths in 2013 were due to slips, trips and falls. In addition to workplace design and personal protective equipment, Pankok’s student research through the Ergonomics Lab emphasizes the need for administrative controls to further prevent worker falls. Dr. Pankok is now working as a post-doctoral research associate in the Department of Information Science, in the College of Computing & Informatics at Drexel University.